Over Memorial weekend, a nearby town celebrates Memorial Day with a variety of activities including a parade. Another activity is a 5K run. I have been exercising for a few months, improving my overall health and fitness and I decided to run in the 5K (which is really 3.10 miles). It was a great morning for a run, not hot and not raining! There were many participants and Meadowe was so excited to watch Mommy run and to cheer for Mommy. 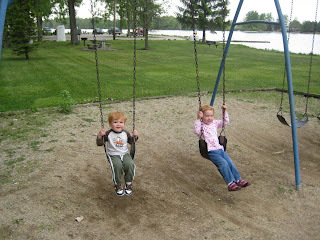 So, the race began and while waiting for me to arrive at the finish line, Daddy pushed Meadowe and Finn on the park swings. They climbed up to the top of the slide, but then decided it was too high and Daddy had to climb up with them and help them back down. 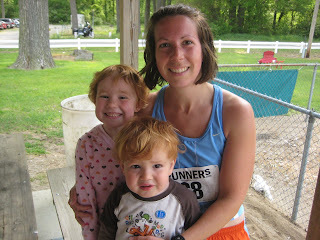 As I neared the finish line, Daddy, Meadowe, and Finn were there to help me give my all at the end of the race. I did a great job coming in 29th overall (and 10 minutes behind the first place overall finisher), out of at least 50 participants, and also receiving 3rd place in my age group, and setting a personal best time for the distance. I'm so glad my family could be there to cheer me on at the start and be waiting for me at the finish. What a great family time. On Memorial Day, the town has a parade. Ora's brother is a volunteer firefighter for the town and his 2 kids ride the fire truck, so of course, they want Meadowe to ride with them, and she wants to as well. She has a blast up on top of the rig with her cousins, waving American flags and waving and smiling at all the onlookers. This is Meadowe's second year to ride the truck. 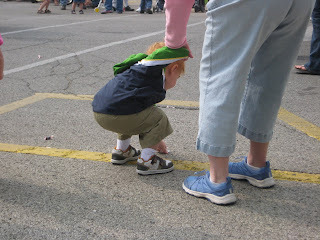 Finn discovered the joy and fun of running out from the sidewalk to pick up candy that is thrown out of the floats and other cars. We had a designated bag for all the candy and he thrilled to add more and more candy to the bag. Another special surprise was my friend Sarah and her 2 children coming to watch the parade. 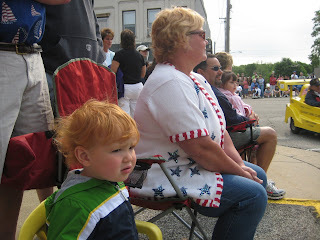 It was nice to visit with her and watch her children take in the excitement of the parade. After the parade Meadowe met up with us and as we walked back to our cars, Meadowe and Sarah's son JJ held hands and talked to each other, sharing stories and just chatting each other up like old friends. Which is really what they are. 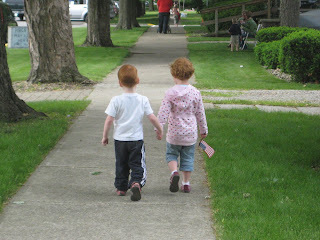 They are only 3 months apart in age and have been friends from infancy. We get together as much as we can for them to spend time together. Finn and Sarah's daughter are also almost 3 months apart in age and so they get along well too. Warm & sunny greetings to you! I am so thankful for the warm weather to finally be here and for having the freedom to enjoy it safely. As I mentioned in another post, Finn loves to help me cook. On this particular evening there were many tasks he was capable of doing. 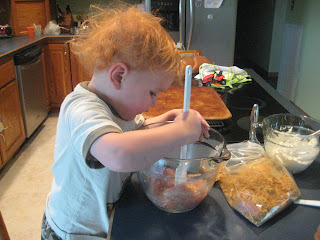 Above he is crushing chips for the coating to go on the chicken pieces. 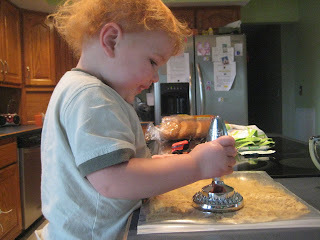 He thoroughly enjoyed pounding the chips to minuscule particles. 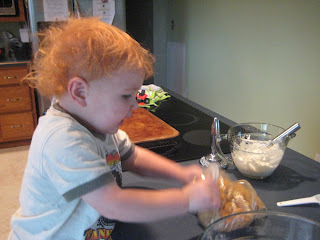 Below, he is helping stir the seasoning onto the chicken, and lastly, he is shaking the bag to coat the chicken with the crushed chips. Pretty sure that shaking the bag was his favorite part! He is so interested in helping me cook, and he stays with it to the end. 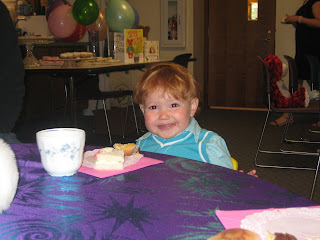 We had been attending story time at the library for several weeks, and the last week was a special teddy bear tea party. The tables were decorated with shiny cloths, doily plates, and real china teacups. There were sweet and savory snacks, and tea and lemonade. 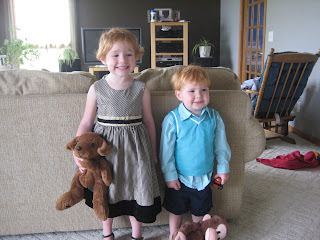 Each child was encouraged to dress up and bring their favorite teddy bear or animal. Finn and Meadowe had a glorious time doing something just a little bit out of the ordinary. They must have felt so special sitting down next to a friend at a pretty table with tiny little snacks. I think it was one of the best things they have done in a while. Finn has discovered POCKETS! He loves having pockets in his pants. He likes to cram things into his pockets, and he likes to stuff his hands in his pockets. He often refuses to wear shorts or pants that do not have at least one pocket. 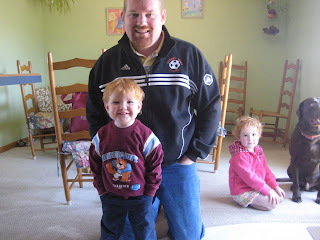 Below is a pic of Daddy and Finn, who is nearly beside himself with happiness that he can get both hands in his pockets. 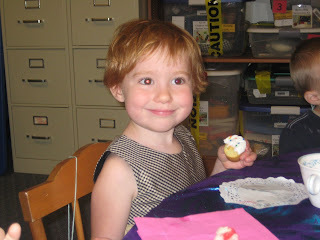 Meanwhile, Meadowe just likes to wear her little skirts, which is what she's wearing here.